Values your time, “Back & Edit” feature saves entered data when you want to move to previous form page to make corrections. Form Processor Pro is developed using PHP, which is the most popular web programming language, so it is compatible with most web servers. Installation is easy and fast. Just follow the installation guide, which is included in the user’s manual. If you wish, you can order script installation and configuration service, and our engineers will do the work for you.All settings can be easily modified in a single configuration file for all forms. No programming is required, simply open file in a text editor (e.g. Notepad) and make modifications to script settings and forms. Create web forms using your favorite HTML editor (e.g. Microsoft Frontpage ®, Adobe Dreamweaver ® ). Generate as many fields as you like, create forms on multiple pages – Form Processor Pro will handle all of them. 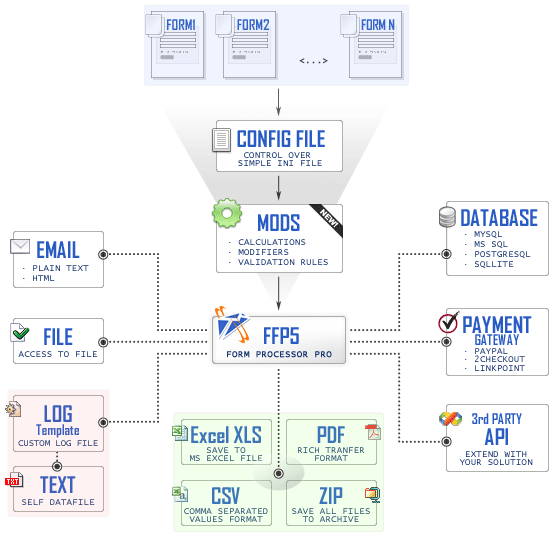 Set up Form Processor Pro to gather information from web forms. Mark out required fields, customize ‘thank you’ page, set up autoresponder. For each form you can decide what to do with filled information: whether it will be calculated, stored to a database, or sent to email recipients. Need an easier solution to create and handle web forms? Get Form Maker Pro. Form Generator. Form Maker Pro will create any web forms you like, so you don’t need to buy expensive html editors just to create web forms. Easier to use. Form Maker Pro has a visual user-friendly interface, so you don’t need to edit any configuration files in text editor. Faster form setup. By generating web-forms with Form Maker Pro, you eliminate the need for pointing each web form to a form processing script. Form Maker Pro will automatically do it for you. Check the comparison table to make the right choice.